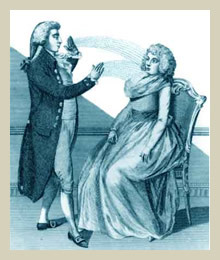 The modern era of hypnosis and hypnotherapy really begins with Franz Anton Mesmer (1734-1815), the Viennese physician who left the word “mesmerism” to posterity. For various reasons, he also gave hypnosis the rather unsalubrious reputation that still persists in some quarters today. Of course, as we now know, hypnosis and trance states are fundamental human traits, which have been around for as long as humanity itself. Ancient texts from Egypt, China, Greece and Rome all describe practices that we might now regard as hypnotic. For example, a 3rd Century CE papyrus discovered at Thebes describes a divinatory rite, in which a boy slave is entranced by the flickering flames of an oil lamp in order to give oracular advice (I). It would, of course, be wrong to speak about “ancient hypnotherapy”, since most of the suggestive historical examples we have concern magical practices, rather than healing per se (although magic is often concerned with healing, of course). Mesmer was the first to lead hypnotism out of the realms of the occult and into scientific study, although some might argue that he didn’t lead it very far! As a young man, Mesmer studied theology and law before moving on to medicine. The theory which made his name and ensured his notoriety was that of “animal magnetism”, something which had its origins in his doctoral thesis, completed at the University of Vienna in 1766. Mesmer was highly influenced by the work of Isaac Newton and the theory of gravity. He theorized that the “tidal” influences of the planets also operate on the human body through a universal force, which he termed “animal magnetism”. At the time that it was written, Mesmer’s thesis aroused no controversy, and at the age of 33, he went on to found a perfectly conventional practice in Vienna. As he approached his forties, however, he found himself increasingly dissatisfied with the approach to medicine that was current at the time – a combination of bleeding, purgatives and opiates that was often more painful and terrifying than the conditions it sought to treat. Mesmer favoured an altogether gentler approach, and his devotion to his patients was quite extraordinary. His breakthrough case was that of Franzl Oesterline, a 27 year old woman suffering from what Mesmer described as a convulsive malady, “the most troublesome symptoms of which was that the blood rushed to her head and there set up the most cruel toothaches and earaches, followed by delirium, rage, vomiting and swooning” (II). These symptoms were so severe that Fraulein Oesterline moved into Mesmer’s house to receive round-the-clock care. Returning to the theories of his student days, Mesmer effected a cure by, as he saw it, using a magnet to disrupt the gravitational tides adversely affecting his patient. He successfully induced in Fraulein Oesterline the sensation of a fluid draining rapidly from her body, taking her illness with it. Her recovery after that was complete and virtually instantaneous. From a modern perspective, we can see that the results were produced by the hypnotic suggestion of a fluid draining from the body – a wonderful healing metaphor that wouldn’t be out of place in a 21st century hypnotherapy practice. Even Mesmer realised that the magnet had nothing to do with the cure. His system rested on the belief that illness was caused by depleted levels of animal magnetism, and that these could be replenished by the healer transmitting some of his own abundant magnetic force across the ether to the patient. The magnet was simply a device that allowed this to happen, along with the complex and lengthy sequence of hand gestures and touch known as the “mesmeric pass”. Mesmer went on to achieve similarly impressive results with other patients, claiming cures for blindness, paralysis, convulsions and other “hysterical” conditions, as well as effective treatment of menstrual difficulties and haemorrhoids! He became a celebrity, going on tour and giving dramatic demonstrations of his techniques and powers at the courts of the European nobility. Mesmer’s taste for theatre and showmanship may well have contributed to the hostile reception he received from the medical establishment of the day, although he personally believed that it was because he dared to get results without using conventional medical techniques. In any event, his life and career became dogged with controversy. Most famously, he was denounced as a charlatan after curing the concert pianist Maria-Theresa Paradis of psychosomatic blindness. This didn’t meet with the approval of her parents, who stood to lose a royal pension if their daughter was cured. She was forcibly and rather violently removed from Mesmer’s house, where she’d been staying to receive treatment, whereupon her blindness returned. Although this says more about her parents than it does about Mesmer, the episode was seized upon by his critics as proof that he was a fraud. Mesmer was irrevocably brought into disrepute when a royal commission was appointed to investigate his findings. The commission, which included such luminaries as Benjamin Franklin and John Guillotine, could find no evidence to support his theories of animal magnetism. They observed that Mesmer was able to cure patients by having them touch “magnetized” trees, but that patients were cured even if they touched “non-magnetized” trees. Therefore, they concluded, Mesmer must be a charlatan. 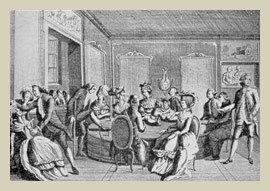 In many ways, Mesmer is a victim of the old adage “that’s all very well in practice, but does it work in theory?” Of course any serious investigation would fail to find evidence of animal magnetism being transferred through the ether, since none of these things exist – this would have been apparent even in the 18th century. However, just as Mesmer was right for the wrong reasons, so his critics were wrong for the right reasons, and failed to draw the correct conclusions from their observations. The psychological truth of Mesmer’s approach went unrecognized, just as the trance-inducing and suggestion techniques that were the real reason for his success lay undiscovered beneath the layers of the magnetic, mesmeric pass. Nevertheless, Mesmer’s legacy persisted, into the nineteenth century and beyond, as arguments over his techniques shaped the development of hypnosis as we know it today. (II) Franz Mesmer, “Dissertation On The Discovery Of Animal Magnetism”, trans George Bloch in “Mesmerism” 1980.